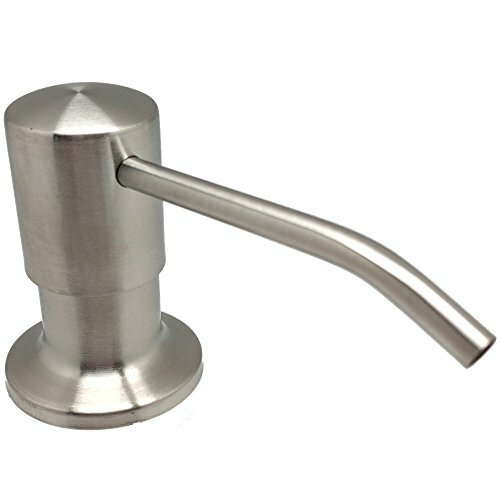 Ultimate Kitchen - Stainless Steel Sink Soap Dispenser (Satin/Brushed Stainless Finish) - 17 OZ Bottle - 3.15 Inch Threaded Tube for Granite Installs- 5-Year Replacement Warranty - Your Best Choice! EXCELLENT DESIGN - Our soap dispenser KEEPS ITS PRIME and has a 3" nozzle that reaches over the sink REFILL FROM THE TOP - Your purchase includes a LARGE CAPACITY (17oz.) Soap Bottle that you can refill from the top. No more crawling under the sink! INSTALLATION VIDEO PROVIDED - The Video is on our website (Link provided in installation instructions). FIVE YEAR REPLACEMENT WARRANTY - If anything goes wrong, we will replace your built in soap dispenser. REFILL FROM THE TOP - Your purchase includes a LARGE CAPACITY (17oz.) Soap Bottle that you can refill from the top. No more crawling under the sink! INSTALLATION VIDEO PROVIDED - The Video is on our website (Link provided in installation instructions). GREAT CUSTOMER SERVICE - Read our customer's reviews to see what GREAT CUSTOMER SERVICE looks like. View More In Bathroom Sink & Bathtub Accessories. If you have any questions about this product by Kitchen Classics, contact us by completing and submitting the form below. If you are looking for a specif part number, please include it with your message.